It is already the second month UK ISPs have been practicing their warning systems within the anticipated piracy alerts campaign. This is a result of the joint effort made by the key copyright owners from media industries, the Government and the leading local Internet providers themselves: the latter ones are now sending warning notifications to potential copyright offenders, whose traffic looks involved in pirating actions. Not surprisingly, such an innovative approach to combat illegal streaming and mass copyrights’ violations confuses many people, who actually are not aware of the possible implications the campaign may bring. Some users switch to new Internet providers, others simply use VPNs. Indeed, why change habits if you can just hide your IP-address? A similar increase in the number of VPN users took place in the US when the Copyright Alert Program was launched in 2013 after three years in development. Currently, the warning system is only targeted at those whose Internet account has been noticed share copyrighted content within P2P networks: file sharing services, mainly BitTorrent, plus such applications as Popcorn Time. Thus, streaming services (e. g. 123movies) and file-hosts (Zippyshare, 4Shared) are still beyond monitoring. However, further campaign initiatives are to come into power very soon and cover the remaining piracy areas. The ‘educational’ notices constitute just a small part of the new initiative introduced by Creative Content UK, previously participating in an anti-piracy PR campaign. BT, Virgin Media, Sky and Talk Talk have officially confirmed their participation in the campaign and way more providers are likely to join them in the short run. The warnings may slightly differ among the providers, but all of them carry an informative message, containing a list of legal alternatives. Worth noticing, the UK ISPs are not monitoring their subscribers’ online activity, they only do send notifications. The actual tracking is performed by MarkMonitor company, a widely known tech partner in the US Copyright Alert System. The anti-piracy program stakeholders agreed to send 2.5 million warnings at maximum in a year, which is only likely to reach a small share of all potential UK pirates. And this includes multiple notices to the same suspicious individuals whose traffic is repeatedly compromised. So why consider using a VPN? MarkMonitor collects alleged IP-addresses brought by BitTorrent swarms and directs them to ISPs. It is claimed that gathered IP-addresses do not reach the Copyrights holders and are only kept recorded in ISPs’ databases for a limited period of time. BUT it is not specified for how long exactly and which parties really have access to the sensitive data. Some online sources say the program authorities agreed to send up to 4 email warnings to alleged Internet users, which must be followed by disconnection. However, there are also alternative reports in press denying such measures and stressing on the ‘educational purpose’ of the campaign. Given the misunderstanding, it is better to be on the alert and connect via VPN. 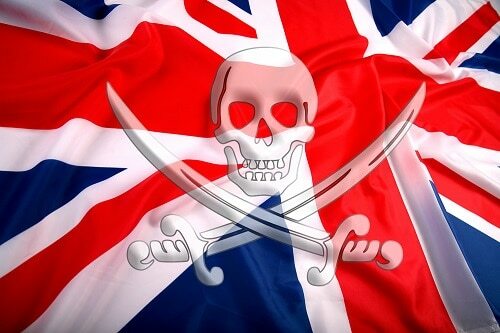 For now, there is no penalty system introduced to empower the UK anti-piracy campaign. However, an innocent torrent download may turn into a crime one day. While ISPs store the alleged IP-addresses for a non-specified ‘short’ period of time, staying undisclosed with a VPN might be a good idea.